I am considering purchasing a manure spreader--perhaps not until spring 2011. We have 2 horses now (maybe get a third in the spring). I am composting the manure now. Every 2 days or so I will empty small bins we keep in the stalls and around the barn to collect manure daily. I empty them into the FEL of my NH T2210 and haul it to the manure pile. I already spread (by hand) a finished 8ft x 8ft pile this fall--a lot went to the garden. I wanted to get the smallest PTO driven spreader to be able to unload a larger load of fresh manure directly into the compost pile and when it is finished to not have to make so many trips back to the manure/compost pile to re-fill once I start spreader on the pastures. Is it safe to load one of these manure spreaders when it is not connected to a tractor? Given that I have only the NH T2210, I would have to load the spreader, then connect to the tractor. Any thoughts or comments? I am just exploring options now; we have only been on our farm for a year so we are still learning the patterns and best ways to get the work done safely! If you shocked the tires and had stands under the front and rear of the spreader I would think you could load it and then hook up to it safely. I would place jack stand under the rear so if rear loaded heavy it does not tip up. Would suggest a good jack for the tongue as the trailer will most certainly need some up or down adjustment to pin it. Be sure all stands are on solid surface so they don't topple if spreader is bumped which sooner or later will happen either loading or hooking up. If your tractor has a fixed draw bar would want to hitch to it to also prevent the spreader from tipping as the load moves to the rear. Wheel placement will affect this a good bit. Thanks for the ideas about the jack-stands to steady the spreader (safety is always my concern) and jack and to help adjust height for hook-up. That was one of the next puzzles I was working on in my head! Have you looked at the Newer Spreader. It works great for 2 or 3 horses. 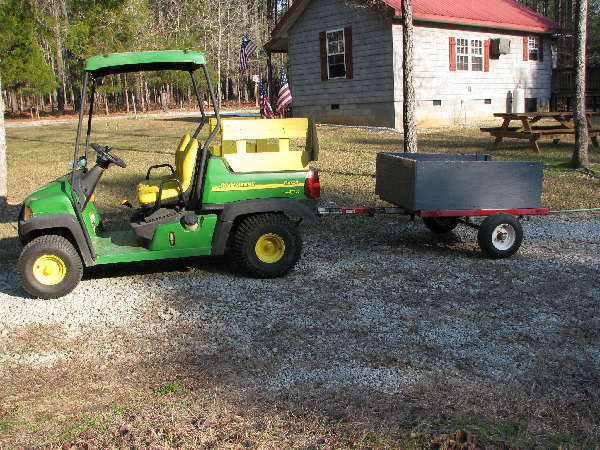 You can maneuver it in stalls by hand and can be pulled by a small tractor or ATV right out to the pastures to spread. Simple, American made design. I have--thanks for the info though. Right now we are composting before we spread the manure--we believe it is healthier as it kills more parasites and fly larvae. I like the small versitile design of the Newer Spreader, and am partly concerned that the smallest PTO spreader (about 50 cu ft or so) may be too big or I would only use it 2 or 3 times a year. Thanks again for the ideas as I work out our patterns. No idea in your area but horse people have taken it on the chin in my world the last couple of years with some giving their horses away as they could not sell them. You might find the used market to be good. Word of caution, be careful with auction unless you can control your emotions. Easy to pay more there than buying new.